In Getting to Green, Rich argues that the Green movement in America has lost its way. Congress has not passed a major piece of environmental legislation for a quarter century. Environmentalists declared climate to be their top priority, but could not bring a carbon-cap-and-trade bill to a vote, even with Democrats in control of Congress. For conservative Republicans, anti-environmentalism has become an article of faith. Pew polling reveals that the environment is one of two things about which Republicans and Democrats disagree most. How did this happen, and what can be done? 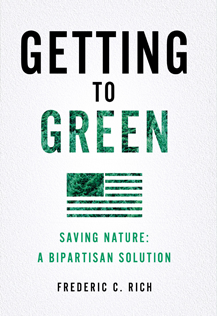 The author starts by telling the story of American conservation’s conservative roots and the bipartisan political consensus that had Republican congressmen voting for, and Richard Nixon signing, the most important environmental legislation of the 1970s. He then narrates the gradual loss of that consensus and its replacement with the “Great Estrangement”: a conservative movement dominated by those deeply suspicious of Green goals and hostile to virtually all policies advocated by environmentalists, and a Green movement that all too often appears antagonistic to business and economic growth. Rich argues that getting the Green movement back on track requires change in three main areas. First, instead of giving up on conservatives, we must seek to reconnect a critical mass of moderates and conservatives with their long tradition of support for conservation. Second, to succeed in the next fifty years, environmentalism needs a coherent, strong, and sustainable rationale, and one that answers the charge that Greens care more about nature than people. And finally, the modern Green movement, which is now a half century old, must look honestly at its own failings and limitations, and get its house in order for the challenges ahead. This includes putting to rest the old Green refrain that economic growth and big corporations are the enemy.